I still remember my first Korean beauty product came from THE FACE SHOP. It was many years ago, and the first item I purchased from this brand is their face sheet masks and sunblock. 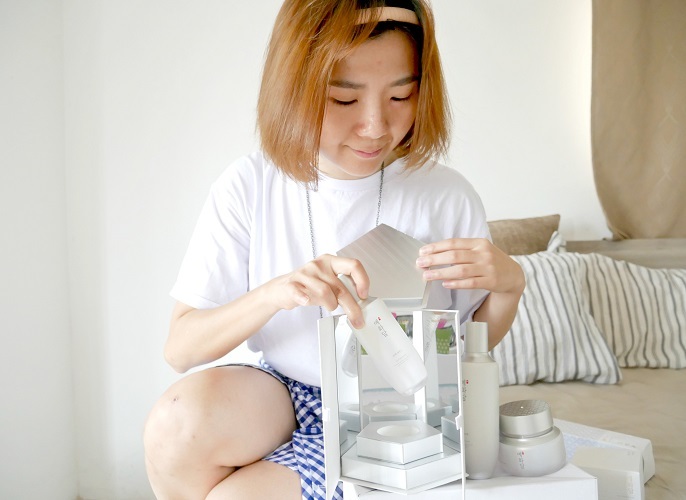 The reason I was attracted to THE FACE SHOP is because this brand is not being very expensive, always comes with beautiful packaging, and offers wide selection of products to choose from, such as skin-care, make-up, body-care and masks. In addition, if you know this brand well, they are pretty well-known for making their products from the finest ingredients from nature. Though there are so many Korean beauty brands pumping up with new faces, I still always keep my eyes on THE FACE SHOP because it has been continue to innovate and develop new products that cater to different consumers' needs. In July, THE FACE SHOP is introducing an anti-aging skin care line, Yehwadam Pure Brightening series which specially designed to bring out brightness and natural radiance of the skin, leaving skin visibly brighter by improving appearance of pigmentation, dark spots, and dull skin tone. 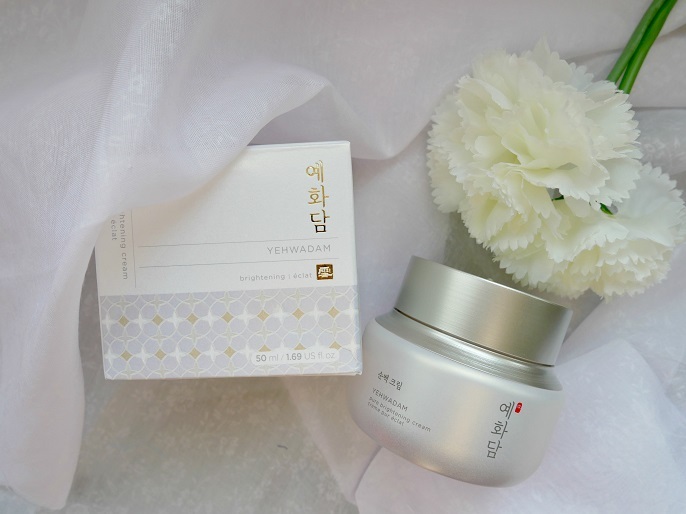 It's a name that created from Ye 蘂, Hwa means 花, Dam 譚.
Yehwadam is inspired by stories of beautiful Korean women, their beauty secrets passed down through the generations, and also the Korean traditional herbs and flower extract that contain inside the product range. 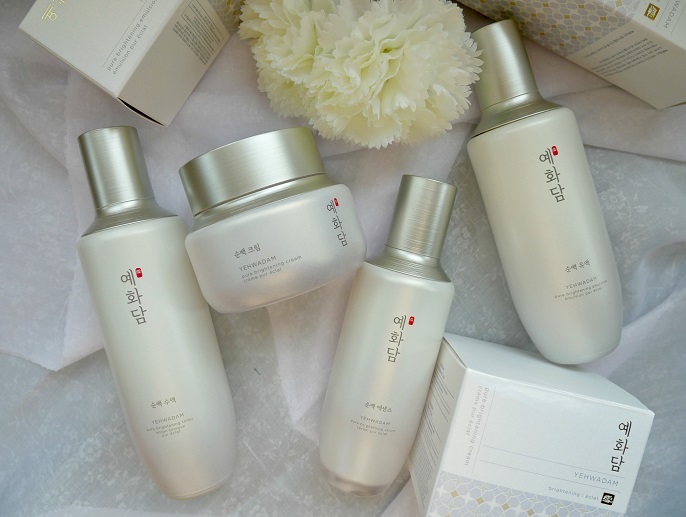 The full product range is formulated with Chil-baek-seol-yun-dan, a brightening formula that consists of 7 brightening and pristine traditional herbs; and processed through using Baek-ja, a method where natural ingredients are heated for a long period of time in order to maximize the efficacy and to eliminate any toxins in the extraction process. It's a special brightening formula that comes with 7 different traditional herbs. These special ingredients are to reveal skin's brightness by improving overall skin tone, and get rid of the dark spots and pigmentation on your face. It's a method that uses traditional processing method of "Jae-ja", a kind of boiling traditional medicinal herbs in pure water. Beak-ja process helps to remove toxins that possibly irritate the body as resulting in the traditional herb that are mild to the skin. Yehwadam Pure Brightening comes with a complete skincare range of toner, serum, emulsion and cream. This soft, fresh toner is personalized for brightening and anti-aging solution. It's not only brighten, glow the look of uneven and dull skin tone, it also helps to add, lock in moisture at the same time. The light and fresh texture allows the brightening toner to glide and absorb into skin gently and softly. 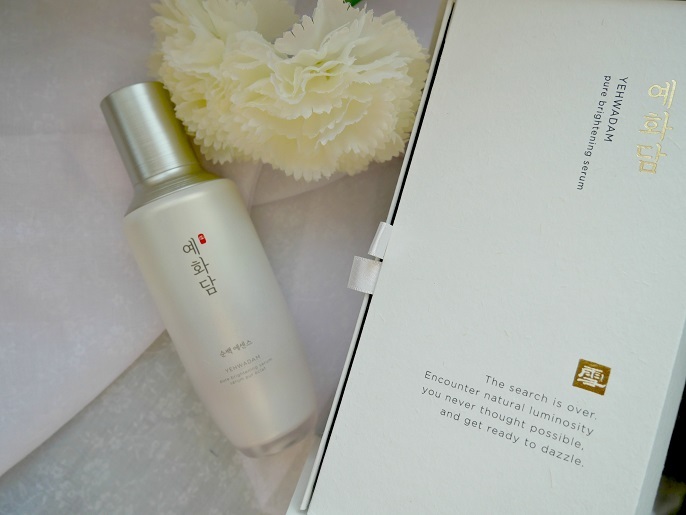 How to use Yehwadam Pure Brightening Toner? After cleansing your face, pour at least 2 drops on your palm or face cotton, then pat gently on your face so that it absorbs well into your skin. My skin is very happy with this toner because the texture is just right; not watery, less heavy and not very sticky. The absorption is fast, and the smell is very fresh and nice too. I would suggest to use face cotton when you apply the toner to allow easy application. Otherwise, you might waste more toner if you just pour it on your palm or directly on your face. 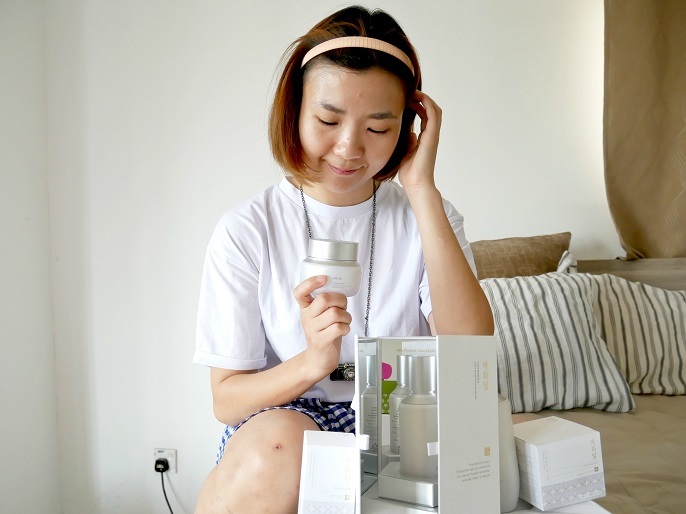 The fresh glowing serum comes with anti-aging formula that penetrates into skin, provides intensive dull skin tones, and also get rids of dark spots and pigmentation. Besides, it also leaves skin illuminated, radiant and glowing too. 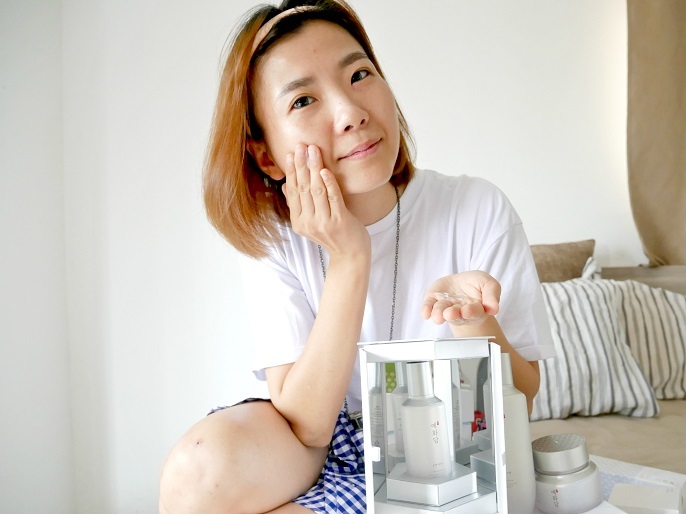 How to use Yehwadam Pure Brightening Serum? After brightening toner, take an appropriate amount of the contents, spread it gently along inside and outside of whole face. And then, use your fingers to dap the serum on your skin directly for better absorption. Serum plays an important role in my skin-care routine; so I used this serum twice a day, in the morning and at night. This product is just as what I expected since it has the similar texture like the other serums I used from THE FACE SHOP. It has a very lightweight finish, and absorbs fast into the skin without leaving any sticky residue. A brightening and anti-aging emulsion which deeply infused with moisture, brighten skin tone, and improved the appearance of dull, dark spots, and pigmented skin. It leaves a lovely instant glow and radiant on the skin too! How to use Yehwadam Pure Brightening Emulsion? In Korean skincare regimen, emulsion becomes one important product for a simple skin-care routine. This emulsion can be used in the morning and at night after the serum. Shake the bottle first, then apply a quarter-sized amount on your fingertips and gently rub the product upwards to your face. Usually we use emulsion during the day time as most of the day time we are out for work and we apply make up so emulsion will have lighter and non-greasy texture for the skin to absorb quicker. As far as I know, emulsion works for people who have oily skin or live in a humid weather like Malaysia, because it helps to restore your skin's moisture-oil balance. This emulsion has the same texture and smell like the brightening serum. Also, I find it works differently like the other emulsion I used from the same brand; since this emulsion is less creamy, and won't form a really sticky layer of the heavier oil residues. 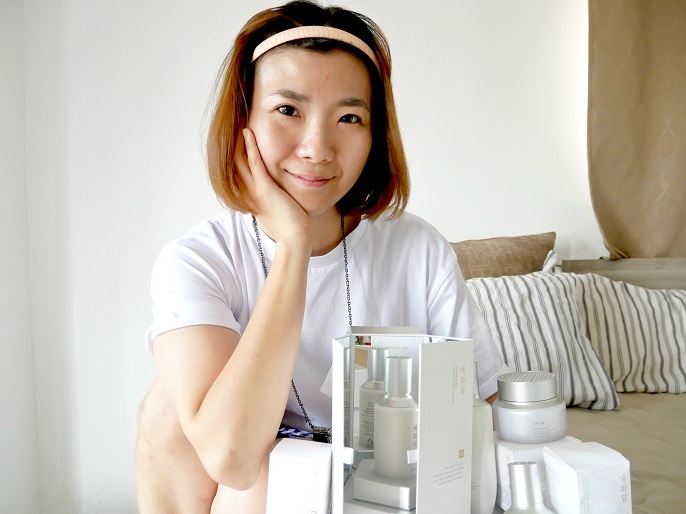 It's a brightening cream that instantly boost skin's radiance and reduce the appearance of age spots and pigmentation. It also works well for soften and smooth the rough skin, which keep your skin supple and moisturized all time. How to use Yehwadam Pure Brightening Cream? The brightening cream will be the last step on your skin-care routine. Take an adequate amount and gently massage over the entire face. It's better to use the rubbing upward motion so that it is evenly distributed in your face, also the massage motion can aid in lifting and plumping the skin. Like the rest of the body our skin does repairing, restoring, and regenerating while we sleep, where it’s the time we focus more on moisture and recovery for the skin over the long hours at night. 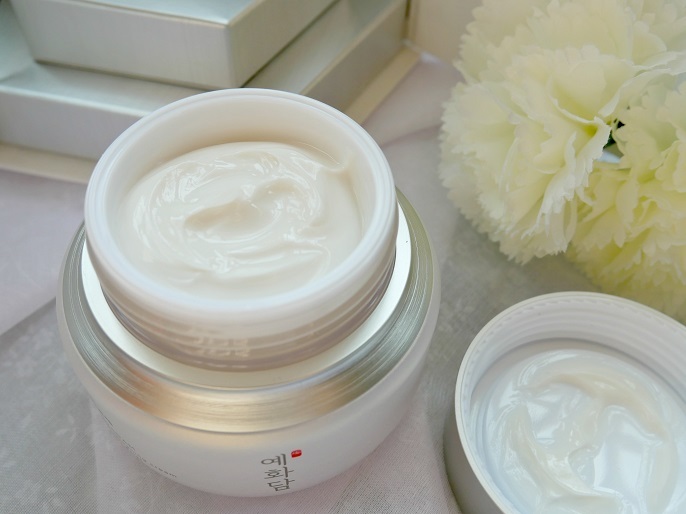 Therefore cream usually suggest to be applied at night with because of its richer texture with deeper moisture. The cream absorbs quickly into my skin and doesn't leave me any sticky feeling. I feel absolutely fresh after using it no matter in the morning or at night time. Bright skin tone is one of the beauty secret weapon for all beautiful women. Some people said that brightening products can cause of dry skin, however the Yehwadam Pure Brightening line is not only for brightening, but also comes with anti-aging and moisture formula so that it won't dry up your skin. Overall, this range is gentle on my skin, not causing any dryness or breakouts in the least, but just leaves my skin feeling fresh.